Diane and Buil Cruise Information from Passengers. Extensive information gathered from others and our own experiences on our Disney Wonder 11/21/2002 3-Night Cruise to the Caribbean (our 17th cruise and 2nd time on Disney). Note, the quotes are just opinions and also any of this info could be changed from what we experience. Much of the information below is presented in a Photogallery format. Our Worst Cruise Was Better than Our Best Other Type of Vacation. Happy Cruising. E-mail is appreciated, for any reason and especially to help correct anything we may misrepresent. 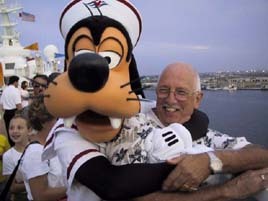 We are not affiliated with Disney Cruise Line in any way. We do have Google Ads and Book Ads. This is a personal website.